There is nothing better than homemade butter. OK there may be something better, but right now all we can think about is rustic bread smothered in creamy, delicious butter. If people knew how easy it is to make this staple, my guess is that everyone would do it. First off, this is a perfect task to give the kids. A guaranteed 10 minute job that produces crowd-pleasing yumminess. 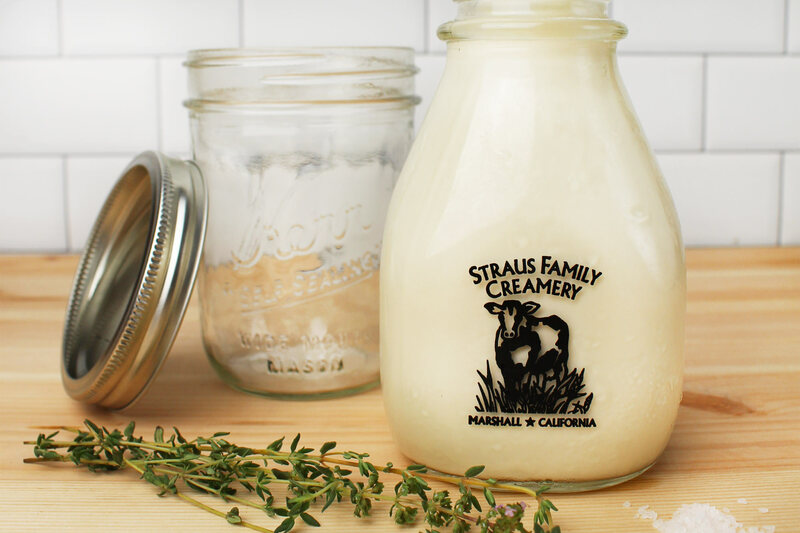 All you need is a Mason jar, some heavy cream, a pinch of salt and a sprinkle of freshly chopped herbs. Fill the Mason Jar half-way full with heavy whipping cream. Screw the lid on tight and start shaking. After 2 minutes, you'll have whipped cream - but don't stop there. After another few minutes, you will start to hear that a lump has formed inside. At this point, add a pinch of salt and herbs to your Mason jar and shake for another minute or so. Remove the solids from the jar. The remaining liquid is buttermilk. We like to save that and use it for french toast or creamy salad dressings. Place the solids into a small bowl. Rinse the butter with cold water and use your hands to squish it into a ball. Discard water and repeat rinsing. At this point you have butter. Serve and enjoy!